Looking for the best bass guitar under 500 dollars? If so, you’re in the right place. A great bass doesn’t always come with a large price tag. This post brings you reviews of 5 of the best on the market as well as a buyers guide. We found the best bass under $500 to be the Orange O-Bass to find out why keep reading! Below is a list of the 5 best bass guitars under 500 dollars which we’re sure you will love. This beautiful bass guitar comes in black, orange, and sunburst. It has a 34″ scale length neck profile that is considered “medium-vintage.” Maple is the wood used on the neck. The nut on the neck is 1.69″ wide. The Okoume wood body manages to be both resonant and lightweight. A Rosewood fretboard with 19 medium-jumbo frets rounds out the construction of this guitar. The sound created by this bass guitar is perfect for anyone looking for a retro sound. With a well-defined and bold mid-range, this bass guitar is appropriate for playing all kinds of music. If you want to play Motown, it just takes a soft touch. If you want to really rock, just strum those strings a little more aggressively. This bass guitar has a split-coil humbucker to cancel out hums and other unwanted noise. It is also great for producing a thick, heavy sound. This is a bass guitar that sounds far more expensive than it actually is. With its sleek appearance and sound range, this instrument sounds like it could have cost you well over $1,000. The technical director of Orange, Adrian Emsley, combined years of experience with these instruments to give you the ultimate experience at an affordable price. This electric bass gives you heavy sound despite it being lightweight. The sound is very crisp and hot. It features a thin “C” shaped neck and a Schecter Diamond P neck pickup with an active 2 band EQ. The decorative inlays are grey pearloid dots. It is available in both 4 and 5 string versions. This guitar comes in only one color, satin black. The body material is Basswood. This is a flat top bass guitar. The neck material is Maple. You will find 24 x-jumbo frets and a fretboard radius of 16″. You can create earth-shaking sounds with this bass guitar and its heavy tones. This bass guitar has very impressive hardware. The S-Tek bridge gives you stable tuning along with an easier setup. You will find standard die cast unit tuners but they hold up well when used in conjunction with the above-average bridge. Musicians report that this is an incredibly fun guitar to play that feels good and creates the perfect range of tones. It is another example of a high-quality instrument that does not break the bank. Schecter is one of the leading brands when it comes to affordable guitars and the Stiletto Stealth is a great example of why. You get a lot of options with this bass guitar. Not only is it available in both 4 and 5 string versions, but you can even get it in a 4-string left-handed model. On top of that, there are 8 different colors available, which each being more attractive than the last. Like many bass guitars, this one is made out of Basswood with a Maple neck. The fretboard is made from Jatoba wood. The neck has a 6-bolt joint for stability. On the neck, you will also find a serial number embossed on a plate. This is a teardrop-shaped guitar that is both stylish and retro. It is very simple to tune this bass guitar thanks to its “3+1” Tuning Key. This method of tuning is designed to give you the most accurately tuned experience possible. This guitar features a single humbucker with active electronics. The chrome plate is trademarked and features the Hi, Low, Volume, and Cut/Boost controls. You will find a uniquely designed 9V preamp on this guitar as well. The look of this guitar is very uncluttered. It is easily recognizable as a StingRay guitar. This guitar is a great option for beginners and pros alike and is an absolute steal for the price. If you are considering this bass guitar, you have some choices to make. This can be bought in Bronco, Jazz Bass, Jazz Bass V, and Precision Bass styles. The Bronco is the least expensive, while the Jazz Bass V is the most. It is also available in six different colors. Not all of the styles can be purchased in all of the colors, however. Every color comes with a sleek, black pickguard. The Jazz Bass Squier has a dual single-coil pickup. This makes the low end sound both clear and punchy. The fingerboard is made of Rosewood and has 20 frets and make a pleasing, warm tone. The neck is “C-shaped.” You will find a unique serial number on the back of the neck. Any style of music can be comfortably played with this bass guitar. There are separate volume controls for each pickup. Squier instruments are all designed by the distinguished guitar makers at Fender. Despite the much lower price tag, these bass guitars share the same basic DNA as their more famous and expensive counterparts. You can look like an iconic rock star for a fraction of the price. This is a great starter bass guitar for any aspiring musician. This guitar has a Poplar body and a Maple neck. You will find a vintage glossy finish on the neck. The fretboard is also Maple and has black dot inlays. There are 20 medium sized frets. This sleek looking bass guitar comes in 9 different colors, including Tri Fade Burst and Coral Red. The tortoiseshell pickguard adds to the visual appeal. This is a 4-string bass guitar. You get a classic sound when playing this bass guitar. This is created by the custom electronic 2-band EQ. Having this feature gives you a wide range of tonal options. It is very easy to tune this guitar and it stays tuned for many playing sessions to come. This guitar comes with a standard fixed bridge and chrome hardware. With this bass guitar, you get a passive pickup. The vintage sound comes from the Ibanez DXP neck pickup and a DXJ bridge pickup. Combining a classic look with a punchy sound, this is a fantastic option at the bottom of the bass guitar price range. This is a great option for beginners or seasoned pros that are looking for a punchy sound. Users generally have nothing but positive things to say about this guitar, with the only exception being occasional fret buzzing. Instruments are tricky when it comes to setting a budget. While you do not want to end up overspending, you also do not want to waste money on an inferior product. With some research, it is possible to find a high-quality bass guitar for under $500. 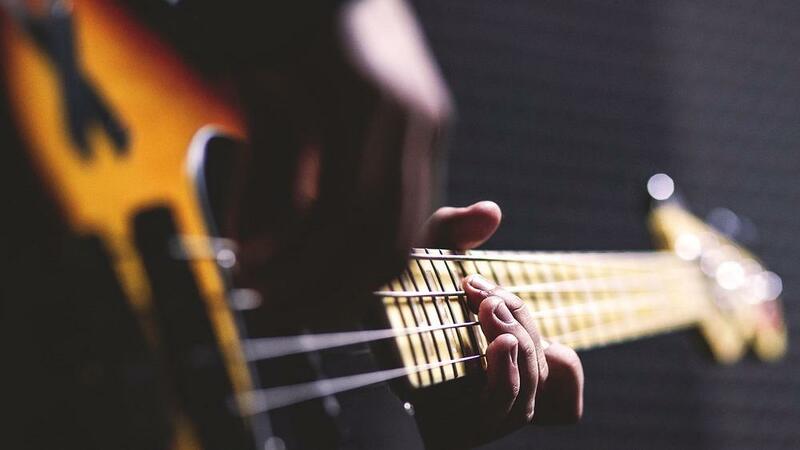 By following this guide, which is designed to go over the most important things to look for, you can be the proud owner of an affordable bass guitar. Many experts will tell you that the most important thing about a bass guitar is how comfortable it is to play it. In fact, all you really need when starting out is an instrument that is comfortable to play with an easy setup and decent quality components. As a result, it is important to not do all of your research online. Driving to an actual guitar store to hold a few bass guitars is definitely worth your time. Bass guitars typically have 4 or 5 strings, although you will rarely find 6-string versions. For beginners, a 4-string guitar is perfect. Guitars with 5 strings have a lower B that helps give it a deeper range. Guitars with 6 strings have both that lower B and a high C. The problem with adding these strings is it makes the neck wider, making it harder to play. The strings on a bass are thicker than those on an average guitar, no matter how many of them there are. This is what gives the instruments the low tone. For more information on the differences between the bass guitar and different types of guitar check out this article. Since the strings are thicker, the bridge of a bass guitar needs to be bigger. They have more mass and are designed to move vibrations through the body of the instrument better. When doing your research, you will discover that there are three different types of bridges: string-through, through, or a bridge tailpiece combination. A string-through bridge feeds each individual string up the body and over the saddles. A through bridge has the strings going under the bridge and over the saddles. Finally, the bridge tailpiece combination feeds the strings through a completely separate tailpiece that does not connect to the saddle. Bass guitars use quite a bit of wood, which is why the prices can be a bit steep. There are two main types of bodies for bass guitars. They are bolt-on and neck-through. The bolt-on is much more common. With these, the neck is a separate piece that is attached. The neck-through, however, is made of one solid piece. These guitars are considered more durable, but are usually much more expensive than a bolt-on, making finding one in the under $500 price range a challenge. Not all bass guitars have frets. The advantage of having frets is that it makes them much easier to tune. However, the fret-less bass guitar provides you with a unique sound. If you are going to play Jazz music, you may want a fret-less guitar because it gives you that vibrato sound. However, these guitars are more expensive and not as well suited for beginners. If you are shopping for your first bass guitar, you will be looking for one with frets. The preamp on any bass guitar is either active or passive. A preamp is what boosts the pickup’s output and is also responsible for the tone-shaping controls. If you go with a passive pickup, you will not need a power source for it. These systems are more simple, and only have a volume knob, blend control, and tone knob. Active electronics will need an onboard battery to operate. Although this makes them a bit more complicated, they offer much more powerful outputs. You also get a lot more control of the tone shaping. Many guitar makers will offer versions of their products with both active and passive electronics. Going with a passive preamp will likely save you some money. Maple: This is a common and affordable wood type, particularly for bass guitar necks. It provides a clean and bright tone. Basswood: Although this wood does not resonate as much, it is still a good option for bass guitars because it has a short sustain. Rosewood: This is a popular choice for fretboards. It absorbs vibrations and gives a dark, soft tone while offering a great resonance. Ash/Alder: These similar woods both offer you clear and even tones. They are both very attractive for guitars as well. This is especially true of Ash because of the beautiful grain pattern. Agathis: This is a very popular choice for beginner bass guitars because it is inexpensive. It still manages to provide players with a good tone. This is considered a medium wood. Bass guitars are generally made up of a combination of different woods. The best combination for you will depend on the sound you are going for. Bass guitars cost quite a bit, even if you get one for under $500. It is important that you are pleased with the appearance of your new instrument. Many companies offer their product in a variety of colors. Some go for a more modern feel, while many others aim for a retro-vibe. It is important to love every aspect of your new guitar, including how it looks. Almost all brands offer a version of their bass guitar at an affordable price. This means you still have a lot of choices, even if you have a limited budget. That is why it is important to decide exactly what you want from your new instrument and to research all possible options thoroughly. If you’re just starting out and are considering a bass guitar vs. other options check out this post with some great acoustic guitars under $500. Author Dan Levado has been a guitarist in 3 different bands, ran a guitar store and now teaches people to play. Guitarsguy is a participant in the Amazon Services LLC Associates Program. This means we may promote and link to Amazon products and earn a commission for any resulting sales made. This helps us fund the websites running costs.